In Greek mythology, Aethra was the mother of the hero Theseus. Aethra was also a woman with a long association with Helen of Troy. Aethra was a princess of Troezen, for she was the daughter of King Pittheus, and therefore a granddaughter of Pelops. Aethra was said to have had a sister, Henioche. Not much is said of Aethra’s early life, although, according to Pausanias, Bellerophon once asked her father, Pittheus, whether he could marry Aethra. ​Before any marriage could take place though, Bellerophon was exiled from the Argolid Peninsula. Aethra first comes to the fore when Aegeus was the king of Athens, for Aegeus came to Troezen to seek the counsel of Pittheus, after Aegeus received a confusing statement from the Oracle of Delphi. "The bulging mouth of the wineskin, O best of men, Loose not until thou hast reached the height of Athens." Believing he understood the words of the Oracle, Pittheus had Aethra sleep with a drunken Aegeus that same night. Some also tell of how on the same night that Aethra slept with Aegeus, she had a dream which instructed her to wade to the nearby island of Sphaeria, and there offer up a sacrifice to Sphaerus, the charioteer of Pelops. Aethra did as she had been instructed but as she was offering up the sacrifice, Poseidon emerged from the sea and forced himself upon her. Aethra was now of course pregnant, although whether the father was Aegeus or Poseidon, is never determined. 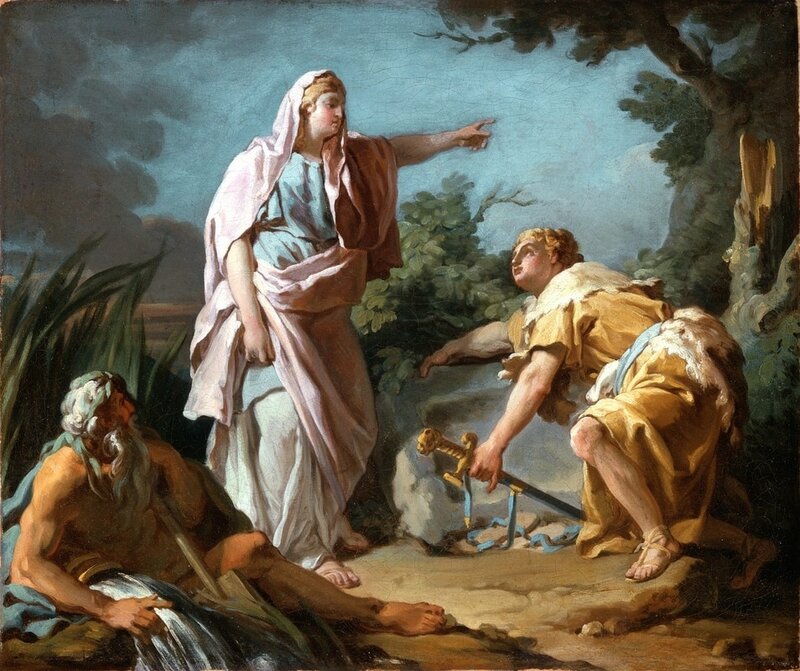 Aegeus would return to Athens, but he instructed Aethra, that if she were pregnant with a boy, to raise him well, but not reveal who his father was (Aegeus was unaware that Aethra had also slept with Poseidon). Aethra was told though that when of age the boy, must move a large rock from its resting place, for beneath it, Aegeus had placed his sword and sandals, so that the boy might be recognised in future. Aethra did give birth to a boy, a boy that was named Theseus, and as he grew up, the son of Aethra was taught by his grandfather, Pittheus. It is also occasionally said that the wise centaur Chiron also aided in the training of the young Theseus. When of age, Aethra took her son to the rock under which Aegeus had hidden his possessions, and Theseus retrieved them, and made his way to Athens. At some point Aethra followed her son to Attica, for Theseus’ mother is next mentioned years later, when Theseus is seeking a new wife, after the death of Phaedra. Theseus and Pirithous decide that they are deserving to wed daughters of Zeus, and so the pair head to Sparta, for Theseus has set his heart on marrying the young Helen, daughter of Zeus and Leda. The abduction of Helen by Theseus was an easy affair, for she was taken whilst dancing in the temple of Artemis, and Theseus managed to return unmolested to Attica. There he left Helen in the care of Aethra, hidden away in the city of Aphidnae, one of the 12 ancient towns of Attica. Theseus and Pirithous then descended into the Underworld to make Persephone Pirithous’ wife. The abduction of Helen didn’t go unnoticed and soon Castor and Pollox, the heroic brothers of Helen, were leading a Spartan army to Athens. ​Arriving at Athens, Castor and Pollox demanded the return of Helen, but of course the Athenian elders could not do so, because she was not in Athens, and believing the Athenians were lying, Castor and Pollox declared war upon them. Eventually, it was revealed that Helen was in Aphidnae, and that town easily fell to the Spartans. Helen was retrieved and Aethra was taken as a captive, becoming the handmaid of the Helen. For many years, Aethra would remain as a servant of Helen, and when Helen was later taken by the Trojan prince Paris, and transported to Troy, Aethra went with her mistress. Throughout the Trojan War Aethra was found alongside Helen. When the war ended and Helen was taken back to the Achaean camp, Aethra was recognised by Demophon and Acamas, her grandsons, born to Theseus and Phaedra. Demophon went to the commander of the Achaean force, Agamemnon, and asked that Aethra be released from servitude. Agamemnon asked his sister-in-law Helen to give up Aethra, and this Helen did, so for the first time in many years Aethra was a free woman again. Aethra probably returned with Demophon to Athens, and Demophon succeeded Menestheus as king of Athens. Aethra possibly died of old age in Athens, although some tell of committing suicide when both Demophon and Acamas died in accidents soon after the end of the Trojan War.